Discussion in 'Grinders' started by dancom, Jan 27, 2017. OK wheel geeks... heads up. I found these gnarly 6" idly wheels at Princess Auto surplus last weekend. They're made of aluminum and grey sort-of-soft rubber; treaded like a front tractor wheel. The hub is 14.4 mm (0.56") and its teammates are two 5002Z sealed bearings hiding an internal spacer. I think this bit of PIHSIANG was meant for more rough and tumble than a Rodeo Flyer. But how much more is the question. If you got some other ideas for uses, post! I'm not a princess auto fan. I bought a pair of their heavy duty Castors when I made a plastic mulch layer. I found the quality to be terrible. Be careful if you decide to try these on a grinder as they might fail in a spectacular fashion. 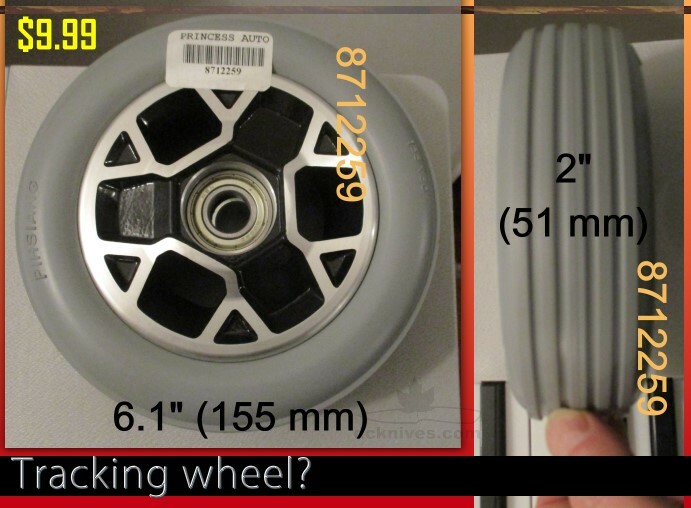 I have looked at the larger caster wheels at princess auto to use as contact wheels but they didn't have any that were 2" wide. A while back I did find some on Amazon.ca. Here are just a couple examples. This first one may be a good tracking wheel. This one is very tempting to order for a contact wheel. Most caster wheels are on roller bearing and shouldn't be used in any kind of speed applications in idler positions. They will require a proper set of bearings installed for idling. Unless you have a lathe handy, it's probably more cost then it's worth to install bearings. These particular ones are (what I was told by the associate in the store) for wheelchairs. I've used a 4" poly wheel on my 2"x72" as the drive wheel for four years now. Bearings don't matter for a drive wheel it just needs to be fairly balanced. I pushed the roller bearing out and pressed in a 0.875" ID (1.125" OD) bushing with the hydraulic press. After broaching the keyway, drilled into the wheel radially and tapped a 1/4-20 thread to secure the set screw. Once installed on the motor shaft I took this video. Ya. The bearings would definitely have to be replaced. It should be easy enough to find a proper bearing. Worst case I do have a lathe but hopefully it doesn't come to that. I've been using longboard wheels as idlers and tracking wheel but I purchased my drive wheel from Beaumont.